Although these are correct examples for modes and one way they could be worked out, the point of reference for describing how they are created is completely wrong. If you were to ask someone who thinks in this way how to play a Lydian mode on F then their answer would be “that’s a C major scale”, which it is not. The correct answer should be “that’s an F major scale with a sharpened 4th degree/note”. 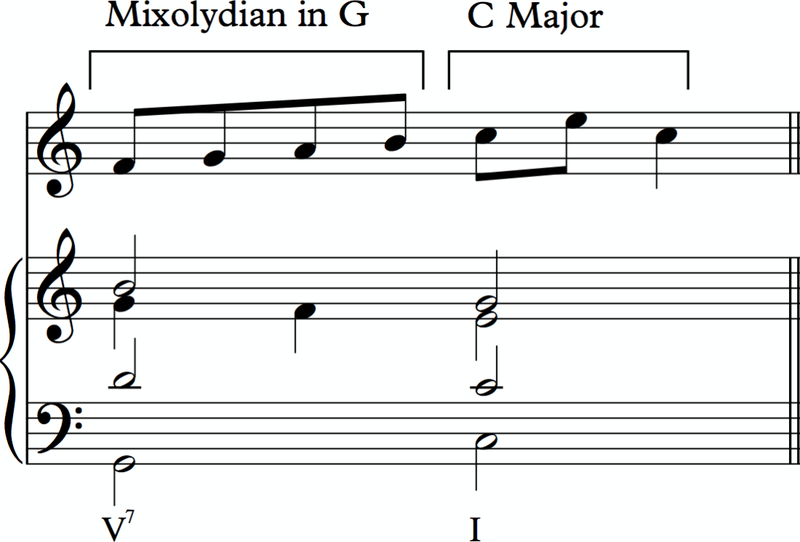 In fact George Russell and Mile Davis would argue that a Lydian mode is the true starting point for any key, and that we achieve the Major scale or Ionian mode by flattening the 4th. In the following explanation, therefore, I shall do exactly that and you will see why. The important thing to recognise is that, in modern music at least, each mode has a melodic function. It’s not just that we may choose to compose a melody using a particular mode so that it has a folk sound or creates a particular mood. For each chord we may choose to put into a sequence there is a mode that accompanies it that sounds good and enables us to move and resolve smoothly on to the next chord. So here’s how it works: There are a couple rules to know and a couple of scales that are not modes of the major scale that you need to be shown. 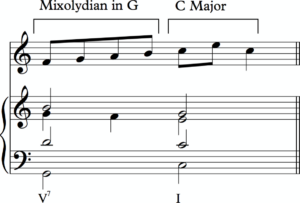 Having these extra couple scales helps you to understand the melodic function of the others. There are two functions of a scale – tonic and dominant. A tonic scale goes nicely with our home chord. So a C (maj7) chord, which includes the notes C E G (+ B). You play the major scale or lydian mode over this chord. The extra scales you need to know about to aid understanding are the Lydian Dominant (Major scale with a sharpened 4th and flattened 7th). This is actually a mode of the Jazz minor scale (Like a major scale with a flattened 3rd and also known as the ascending half of a Melodic Minor scale). Knowing about the existence of these two scales just helps to fill in all the gaps when defining the function of the rest. The vitally important thing to notice here (which is why the Lydian belongs at the top) is that every time you move from one mode to the next; Lydian – Ionian – Mixolydian – Dorian – Aeolian – Phrygian – Locrian; the note that you are flattening is a 5th lower than the last one you flattened; 4th, 7th, 3rd, 6th, 2nd, 5th, 1st; which means what? – It follows the circle of 5ths! The circle of fifths is present in all aspects of western music. Above each scale is a definition of it’s musical function – if it says “dominant” then the sound created will resolve nicely to one of the tonic modes. 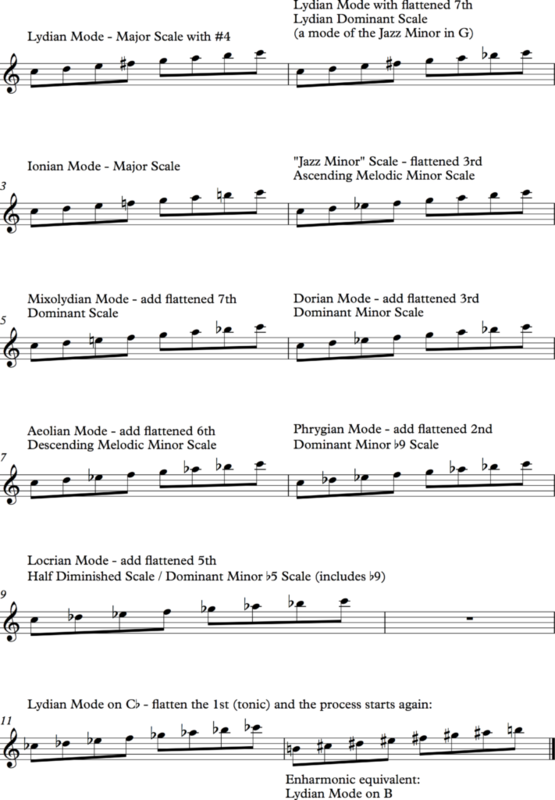 The Dorian mode is most commonly used over chord ii7 in a ii7-V7-I cadence. The half-diminished scale is the equivalent in a minor key – ii7b5, V7b9, i. Also worth noticing is that the Dorian mode relates to the Jazz Minor in the same way as the Mixolydian mode relates to the Major scale (and that is the same as the relationship between the Lydian mode and the Lydian Dominant). Please leave comments if you would like further explanation.